Over the past week or so, I've been been visiting some of the so-called "sky island" ranges of the southwest. Specifically, I've been to the Chisos, Davis, and Guadalupe ranges. Sky islands are interesting. 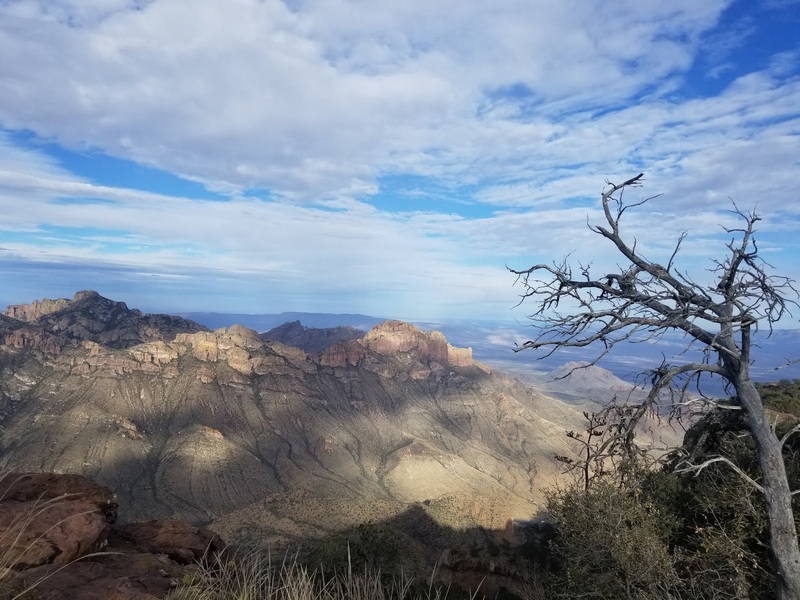 Dozens of isolated mountain ranges rise several thousand feet above their desert surroundings, creating environments that are radically different from the surrounding lowlands. These cooler, wetter climates support many interesting species of plants and animals, some found nowhere else on earth. I saw this phenomenon first-hand in the Chisos Range, the centerpiece of Big Bend National Park. On a quick three-day backpacking trip, I started at 5,000 and quickly climbed to nearly 8,000 feet, surrounded by lush pines. As I dropped to 3,800 feet, the vegetation changed - becoming more thorny and scrubby. Ocotillo and its prickly cousins predominaated the landscape. I passed through various geological layers: sandstone, limestone, and I don't know what else - I'm no geologist! On my final night of the trip, I had the opportunity to camp right on the rim that forms the southern edge of the Chisos escarpment. As I ate supper, I watched the sun set from the top of the world, three thousand feet above everything else. 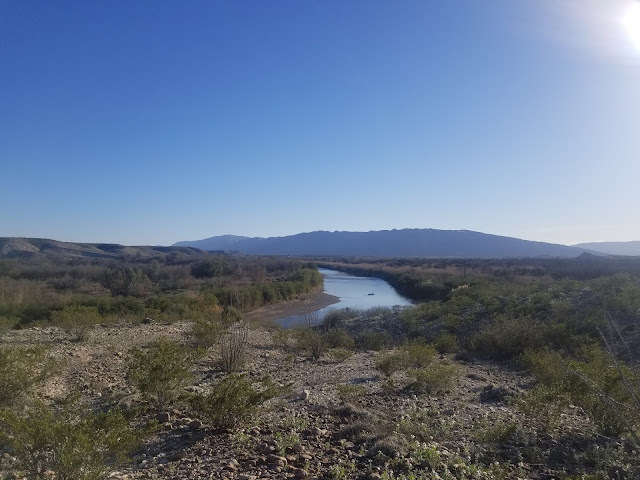 No trip to Big Bend would be complete without a trip down to the Rio Grande itself. My campsite, a stone's throw from Mexico (I know this because I threw a stone and hit Mexico), was prime for dew and condensation as temperatures dipped overnight - but the incredible night sky and the sound of the tumbling river made it more than worth it. The next morning, I crossed the international border on the "ferry" (yes, it's officially sanctioned, but it's really just a dude in a dilapidated rowboat) and popped over to Boquillas, in the Mexican state of Coahuila. I had a great meal (goat for breakfast!) and a little walk around town before returning to Texas on the ferry. Boquillas is a total tourist town (the nearest real civilization/grocery store on the Mexican side is about a 4 hour drive) but it was interesting to walk around anyway. 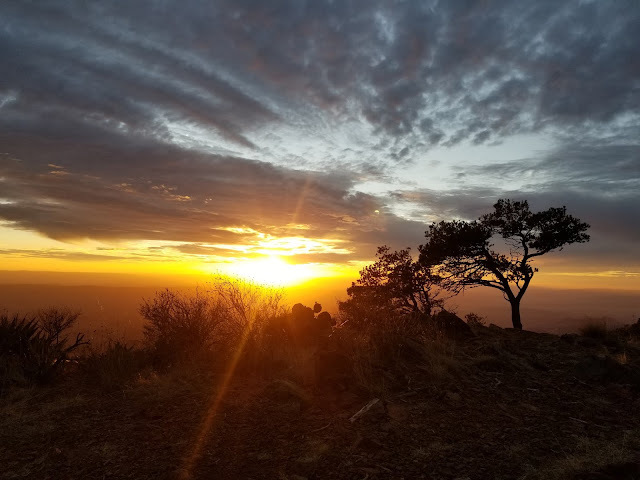 My visit to the Davis Mountains was quite different. I struck out on visiting the really neat observatory operated by the University of Texas - it required tickets, which were sold out months ago. 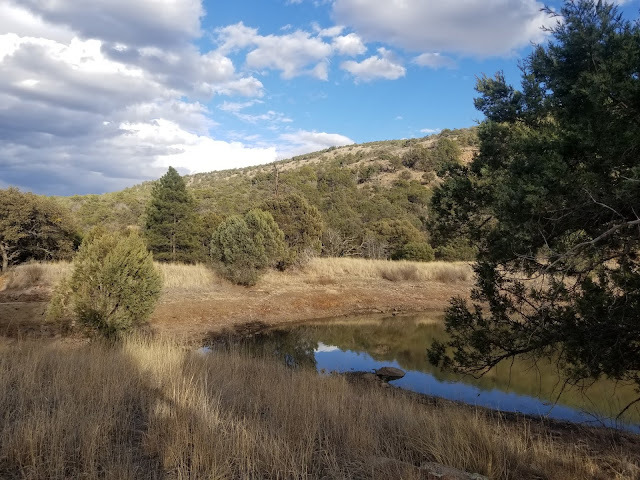 But, a few miles down the road, I found a terrific little campsite (not easy in Texas, which is almost entirely private land) and to boot, a little 2.5-mile hiking loop starting from the parking area where I was camping. Truthfully, it wasn't a particularly spectacular hike. But it was nice. And just as importantly, it was quiet and peaceful. It was mine. A nice little discovery. Even in 21st century, there's such thing as spontaneity. My visit to the Guadalupe Mountains consisted mainly in seeing them from afar. There are plenty of trails in the National Park, and easily available backcountry permits. I planned to climb the highest peak in Texas (Guadalupe Peak, 8,700+), but with winds already gusting to 40 mph and forecasted to increase to 60 mph, that seemed unwise. So I didn't do that. 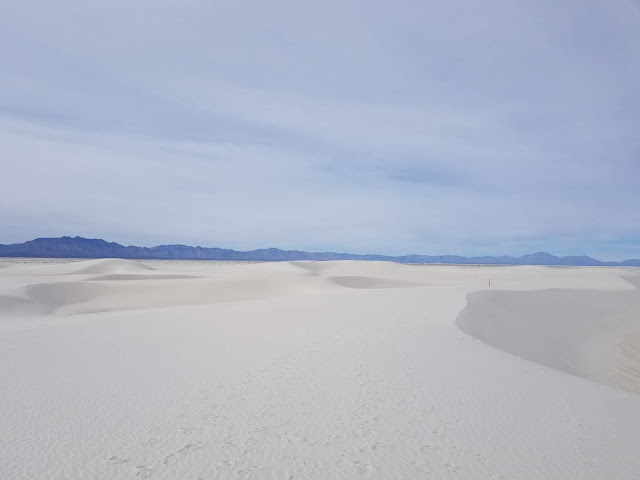 Oh and I went to White Sands National Monument and that was cool too. What's next: I actually did some advanced planning and got myself a ticket for the "you're gonna get dirty" ranger-led tour to an otherwise closed-off part of Carlsbad Caverns. After that, it's back west a little ways to meet up with my sister in Phoenix area. More adventures await! Are We Approaching "Peak Route"?